Gone are the days when you were only able to choose between traditional blade irons and simplistic cavity back irons. These days the types of irons have been further categorised and instead fall into either players, game improvement or super game improvement. These are fairly generalised categories, but all feature certain design aspects and features that make them suitable for different golfers. In this article we look at some of the best game improvement irons on the market that suit the widest range of golfers. These irons are generally designed to offer more distance and forgiveness, while allowing some workability for the slightly lower handicapped golfer seeking to improve even further on to players irons at some stage. Use the quicklinks to navigate our selection of the best game improvement golf irons. 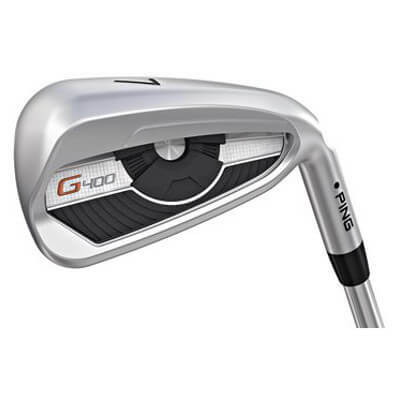 PING G400 irons are our editor’s choice for best game improvement irons. It only makes sense that a set of PING irons would top the list for the best game improvement clubs considering it was this brand that first produced cavity back irons and its original Eye 2 irons set the benchmark for game improvement irons design. The G400 irons are cast, but have an incredible feel thanks to the metal used in the clubhead design along with the vibration dampening badge behind the face in the cavity. 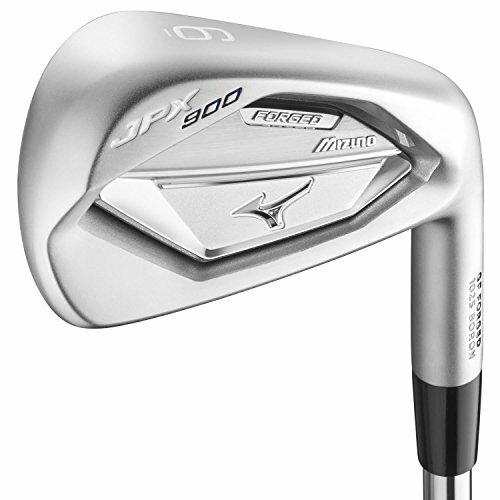 This set forms part of the JPX900 range that also includes the super game improvement JPX900 Hot Metal irons and the players JPX900 Tour irons that are immensely popular on professional tours. The JPX900 Forged irons feature Boron metal that has been infused into the soft carbon steel that makes up the body of the club. This metal is stronger and allows for a thinner face and larger cavity back design that improves distance and forgiveness without sacrificing the silky feel Mizuno irons are known for. 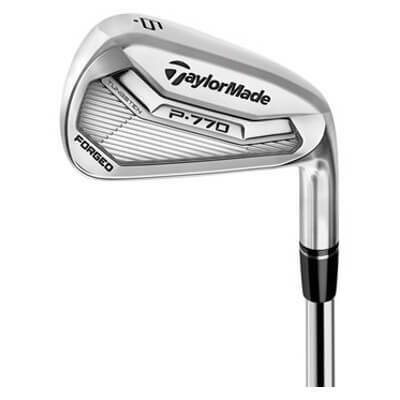 TaylorMade Golf’s latest range of forged irons have a set that fits into every category with P-770 irons sandwiched between the super game improvement P-790 and the players P-750 irons. The brand claims that these irons are revolutionary in their design and feel and they aren’t wrong. The cavity back design is highly forgiving and offers great distance while the forged metal offers an incredibly soft feel despite being so thin in places. Many better players are opting to create a combined set between the P-770 and P-750 irons, as the former are slightly more forgiving and offer a consistently higher and straighter flight in the long irons section. Following the great success of the GBB Epic woods Callaway has produced game improvement irons that deserve the Epic name and follow suit in distance and forgiveness that the woods so successfully produce. Using very premium materials and advanced design features the Epic irons suit a very wide range of players seeking more distance and enjoyment in their game without requiring extra effort. Epic irons rival some of the high end brands when it comes to price, however, you certainly get what you pay for and more. 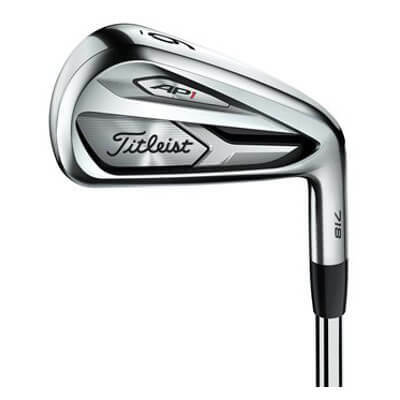 Ever since Titleist launched the first generation of the AP1 irons in the 710 range, this model has evolved to become one of the better sets of game improvement irons on the market. Using many of the design features in the forged AP2 irons the 718 AP1 irons are cast, slightly chunkier in size and have more offset to make them more forgiving and easier to hit. Despite being cast, the multi-material construction offers a softer and more pleasing feel than most other cast irons with plenty of distance, a high launch and loads of forgiveness on mishits. Game improvement irons feature certain design aspects that allow them to fit into this category. They generally have slightly more offset than players irons to give you more time to square the face at impact and therefore produce a soft draw or straight flight. They also have thicker toplines and soles due to the increased perimeter weighting that makes the face more stable and forgiving on mishits. The wider sole helps to reduce the club’s ability to dig into the turf at impact and this helps to produce a consistently cleaner strike. When it comes to feel it all depends on what materials are used in the construction of the clubheads. You may get a game improvement set that is forged and therefore will feel softer, while other sets might be cast but feature vibration dampening material behind the face that improves feel dramatically. Game improvement irons are designed to be easy to use. They generally feature slightly lower than traditional lofts per iron that helps increase distance and reduce spin slightly. The additional offset also helps to ensure a consistently squarer face at impact. For the player seeking a straighter ball flight and isn’t too worried about shaping their shots in the air game improvement irons are definitely the best choice, and with the variety on offer you will find a set that suits your game more precisely. Thanks to the game improvement irons category being so wide you will always find a set of these irons that will suit your budget. Price mostly depends on the materials used in the construction and sometimes the various technologies used by the different brands can affect price too. For the most part it generally comes down to feel and therefore whether you would prefer to pay more for a forged set of irons or settle for a more affordable cast set. 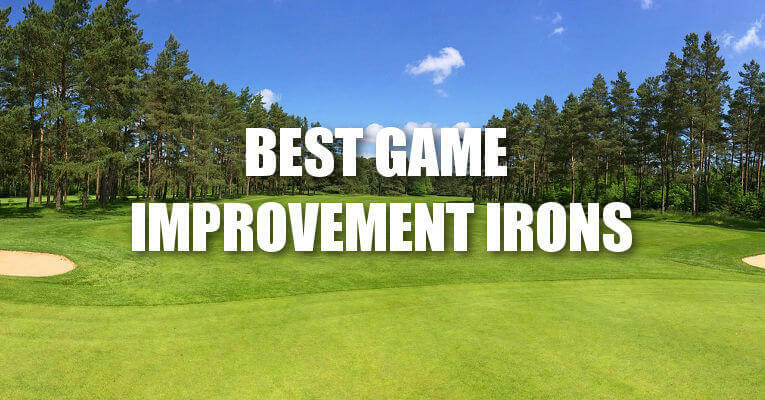 We hope our best game improvement irons review has helped you make an informed choice on the right golf irons for your game, but if your still have questions just leave a comment below and we will respond within 24 hours! Jason ….. I’d have to disagree with your choice of the Ping G400 as a “Game Improvement” iron. I’d put it in a category called “Shot Improvement”. My personal experience has taught me that excessive offset, which this Ping iron has, will not help anyone improve their game. In fact, they will be fighting balls going left of target every time out because the clubface has a little extra time to shut down prior to impact. No chance for improvement there! However, you can put a bad swing on the ball with this club and get a reasonable outcome. Shot improvement! Manufacturers are misleading the public using the term game improvement.